XCOR Aerospace's Lynx spacecraft is shown launching into space with a science payload on its dorsal side in this artist's illustration. MOUNTAIN VIEW, Calif. — The increasing demand for flying experiments in space was clearly in evidence over the weekend as a standing room only crowd of 100 people packed into a room here at the Hacker Dojo to hear about a new era of citizen science. The attendees came to the first-ever Space Hacker Workshop on Saturday and Sunday (May 4 and 5) to learn about how they could build and fly experiments on a new generation of manned suborbital vehicles such as XCOR Aerospace's Lynx space plane. New reusable vehicles slated to come online soon will provide affordable and repeated access to space for professional and amateur scientists and help to revolutionize microgravity research and science education, said Citizens in Space founder Ed Wright. "With the suborbital vehicles being developed...there's going to be an opportunity to fly many thousands of small payloads on suborbital vehicles every year," Wright said. Citizens in Space is a program run by Wright's Texas-based organization, the U.S. Rocket Academy, which has purchased 10 flights aboard the two-seat Lynx just for research. Ten lucky citizen scientists will get to fly in the passenger seat of the vehicle and operate the experiments that they have designed and built. Five of those slots already have been filled. So, just how cheap will it be to fly experiments in space? Wright said that while a typical tiny CubeSat might cost between $3,000 and $5,000 to build and another $100,000 or more to launch into orbit, developing and flying scientific payloads aboard the Lynx will be many orders of magnitude cheaper. "At the base level, you're going to have people who are able to build an experiment for $200 or less and have an opportunity to fly in space through programs such as Citizens in Space, and I think this is just going to change everything," Wright said. Manu Sharma (right, standing) assists Eric Dahlstrom (left) and Ryan Gillespie (right) in a hands-on exercise during the Space Hacker Workshop in Mountain View, Calif. in May 2013. "We may reach the point in five or 10 years where every high school science major will have the opportunity to build and fly a payload in space during the course of his academic career before he graduates,” he added. The development of suborbital vehicles such as the Lynx and Virgin Galactic's SpaceShipTwo is coming at a time when maker spaces are popping up all over the country. Wright said these joint work spaces are perfect places for people to build the types of do-it-yourself science experiments that Citizens in Space wants to fly. Wright's academy is developing the Lynx Cub Payload Carrier, a unit that can hold up to a dozen small experiments in a space behind the pilot's seat. 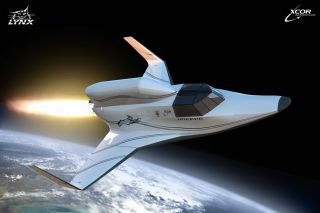 The carrier will give XCOR the ability to fly space tourists in the passenger's seat while also carrying scientific experiments as secondary payloads. Four XCOR employees traveled 300 miles (500 kilometers) north from the town of Mojave, where they are building the first Lynx, to address the Space Hacker audience and answer questions. Khaki Rodway, XCOR's director of payload sales and operations, gave an overview of Lynx's capabilities and a progress update on the assembly of the first vehicle, which could fly by the end of this year. "We're doing it because there's lots of stuff to do," Rodway said of the emerging market for experiments. During the two-day workshop, participants heard talks about the experiments that will be carried out in the microgravity environment and vacuum of space. These experiments will range across many different fields, including materials processing, fluid dynamics, life sciences, protein crystal growth and technology demonstrations. NASA astronaut Yvonne Cagle talked about sending odd "water bears" into space. Water bears, also known as tardigrades, are tiny organisms that are virtually impervious to heat, radiation and vacuum conditions. Cagle believes that by studying water bears, scientists can learn a great deal about how to help humans adapt to space. Jason Reimuller, president of the company Integrated Spaceflight Services, told the audience about his Polar Suborbital Science in the Upper Mesosphere (PoSSUM) campaign, which will use a Lynx to study the dynamics of clouds over the North Pole. The vehicle will operate out of a high-altitude spaceport in either Alaska or Sweden, Reimuller said. Ryan Gillespie, an aerospace engineer from Sunnyvale, Calif., said he is interested in pursuing Citizens in Space's High Altitude Astrobiology Challenge, which is offering cash prizes of up to $10,000 for the development of a device that will collect micro-organisms living at the edge of space. “I'm not so much interested in the $10,000 — it's more the fact that when you come up with anything, it needs a purpose," Gillespie said. "Here's something that actually has a purpose for mankind." Richard Mains of Mains Associates, who works with the NASA Flight Opportunities Program that funds experiments on suborbital vehicles, said these new spaceships are driving technology development at a much faster rate than traditional NASA programs tend to do. "I think what's actually going on here with these reusable suborbital launch vehicles is kind of a whole new paradigm where you're not putting a payload up on the space station for six months," Mains said. "And these vehicles aren't that big. But they are flying very often, So these payloads now have to be small, smart, autonomous — very very easy to kind of activate and deactivate, reprogram, get data out of." "I see all of that driving technology in a very, very interesting fashion," Mains added, mentioning the emergence of open-source platforms as another powerful driver. "So I'm very excited about what I've heard here." Silicon Valley was a perfect location to hold the workshop given that it's at the leading edge of technology development, Mains said. Wright said he was extremely pleased with the workshop, which sold all of its 95 tickets and had a waiting list on Saturday morning. "I think it's gone very well," Wright said. "It's really been a great turnout. It's been very exciting for everyone here. The people from the NASA Flight Opportunities program were very excited about this. XCOR was very excited about this." Wright says he hopes to conduct five or six additional workshops in cities across the country over the next year. Follow us @Spacedotcom, Facebookor Google+. Original article at SPACE.com.